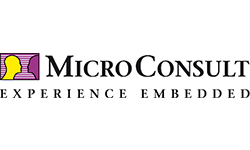 MicroConsult – Your Partner for Embedded Systems Engineering: Professional Training, Consulting, Project Support. When it comes to training, coaching and consulting for embedded systems development, industry professionals have relied on MicroConsult for as many as 40 years. Experts from more than 1,000 companies worldwide have benefitted from the profound know-how and extensive experience of the MicroConsult team. controllers and real-time operating systems through to complex applications. All services can be provided in a format that is tailored to project or customer requirements, providing for an optimized cost-performance ratio. In addition to our training, coaching and consulting services, we offer another valuable platform for you to obtain information about current trends and new developments in the market and to expand your knowledge – the events by MicroConsult. Get the orientation you need to perform future-proof development tasks and stay in touch with customers, partners and friends from the industry. At trade fairs, our annual Embedded Software Engineering Kongress, the MicroConsult Roadshows or compact seminars – we look forward to seeing you!